Whenever I’m in internet-land and I come across a recipe that looks awesome but I don’t really want to make/don’t have the ingredients for at any given time I save them to a bookmarks folder so I don’t forget about them. It also, at least in theory, helps me not get too stuck when new recipe day rolls around and I’m not inspired. This was one of those weeks, so when flipping through my folder, I found Tomato Crostata with Honey-Thyme Glaze, and was like sold! 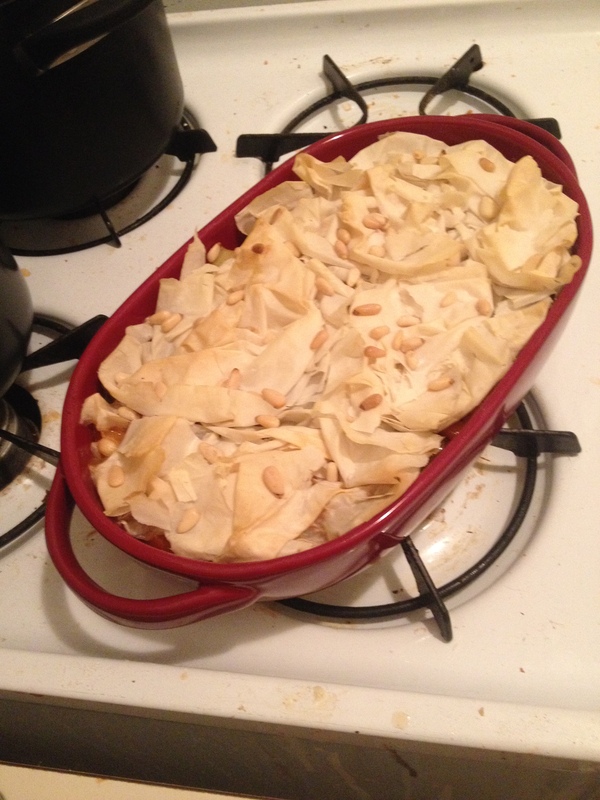 I actually followed the recipe pretty closely, just a few adjustments here and there. Mince the garlic and saute in some olive oil until it has browned, and then set it aside. Put the vinegar, honey, and thyme into a small saucepan and simmer it for a few minutes – like 5 or so. Then set aside (warning, you won’t use all of it so you can either save it for later, or make a smaller amount. Then you assemble everything. You can make this as one big crostada, or a 2 little ones – I made 2 little ones. Roll out the dough to the desired size. Brush with the honey-thyme glaze. Add the tomatoes, leaving some space at the edge in a somewhat overlapping circle and brush them with more of the glaze. Then add the garlic, a little salt, and the cheese. Fold the edges of the tart over or up a bit, and then I sprinkled just a little more of the glaze. Bake at 425 until golden – around 30 minutes give or take. 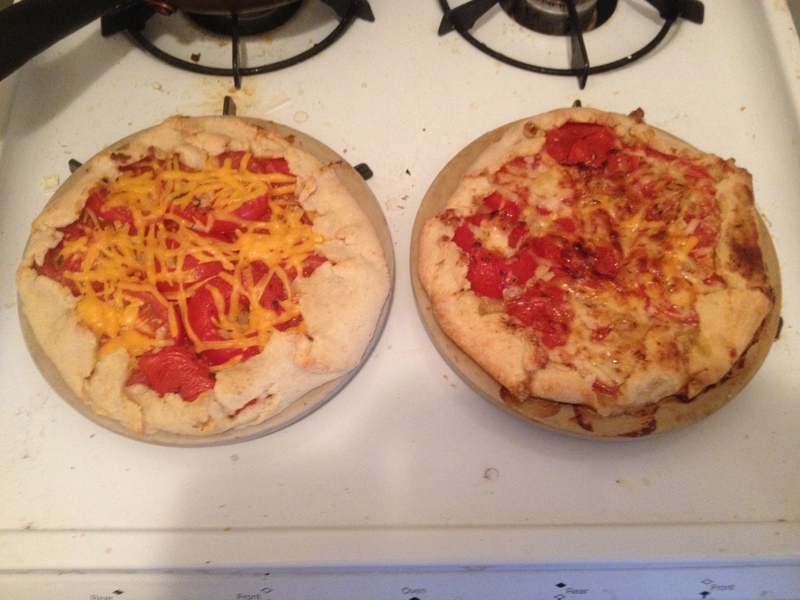 Cooked for slightly different amounts of time with different cheeses – but both good! This is my fav current tomato tart. Don’t get me wrong, I made a pretty good roasted tomato one a while back, but I like this one more. It’s also a bit on the sweet side, which is fun if you are me and have an insatiable sweet tooth. It does get a bit juicy when baking, but that’s not really a major problem in my book. I served this with a white bordeaux. I have a soft spot for white bordeaux and have excellent experience with most bottles in the $10-15 range. I think rose would probably be too fruity with this dish, but most white wines would probably work. Song of the week: What’s Up by 4 Non Blondes. I binged Sense8 over the weekend (and you should too btw) and one of my favorite scenes involved this song. Combine that with a lot of emotional angst in my real life and you have the perfect song for my week. Due a series of family things and odd timing, I have been bouncing all over creation for the past two weeks, including short vacations to Montreal and Portland, Oregon. 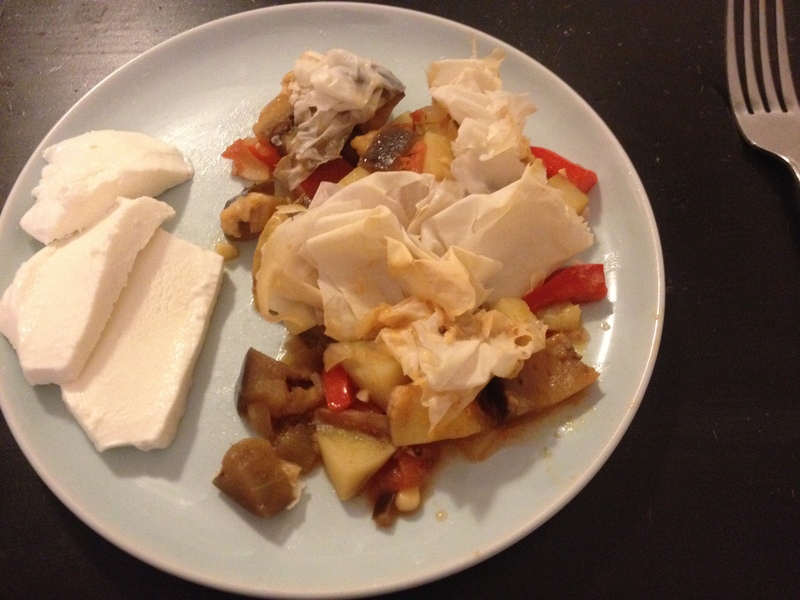 The downside of which is that I haven’t had much opportunity to cook or update this blog. Le sigh. However, I took pictures of some of the random things I’ve had on my travels and jumping around, and here are some of the highlights. Poutine. I was in Montreal for a couple days, so of course I had to try the famous poutine – fries covered in gravy and cheese curds. However, it took a while to find a place that did a vegetarian version. 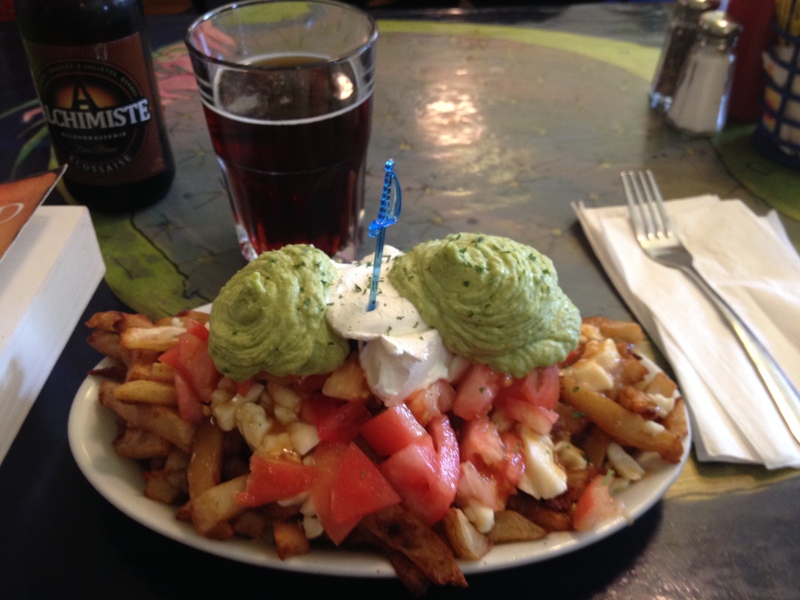 I found La Banquise – which does more than 30 styles of poutine and makes a vegan sauce which can be substituted on any of their dishes. I got La Taquise, which added guacamole, tomatoes and sour cream to the standard mix with the vegan sauce. It was delicious but insanely heavy and filling. I only made it through half of the dish and was stuffed and this was after a three hour walk in the park – share with a friend is my recommendation. Torta with Potatoes and Nopales. In Portland, a land known for microbrewies, I needed something beyond standard pub-fare. And I found a place doing highly recommended Mexico City-style guisados called Mi Mero Mole. I ordered the nopales-potato one in a torta, which turned out to be a giant roll with guacamole smothered on the inside, filled with the guisado, and then covered in cheese. 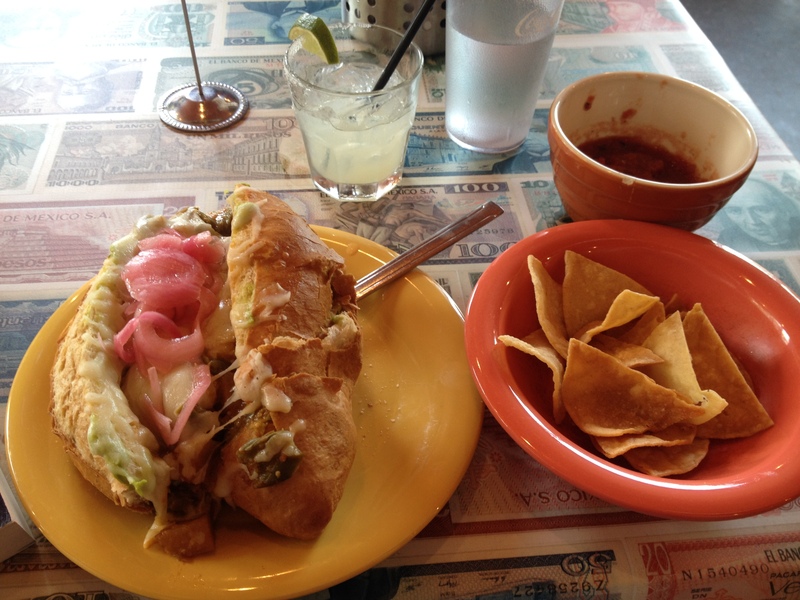 It was beyond delicious – one of the best Mexican dishes I’d ever had. And it was the perfect level of spicy for me. Pair with a margarita of course. 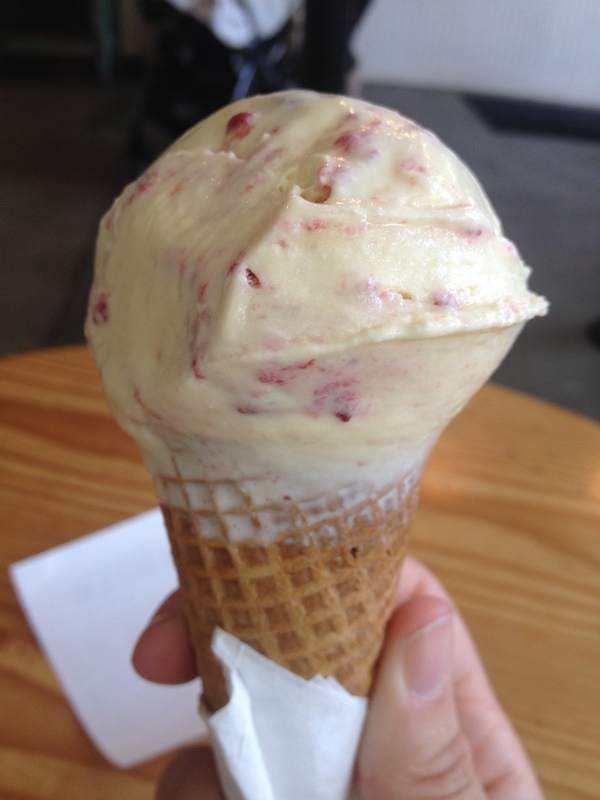 Toasted White Chocolate and Roasted Strawberries ice cream: Seems like an odd flavor for ice cream, but a local ice cream place in Portland was doing five berry flavors for July (berries locally grown, of course) and so I had to try it. This was the single scoop, believe it or not, and was incredible. It had been ages since I’ve gone to a local ice cream place, and damn, it was good. Beer! So much beer over the past couple weeks. Montreal and Canadian beer is no slouch for the record. They do a number of good red ales in particular which I liked, and St. Ambroise is a solidly good brewery that makes a number of different styles and is fairly ubiquitous in Montreal. Portland, of course, is the microbreweries capital of the US. I visited 4 microbreweries, and tried beers from several more. My favorite was Rogue. 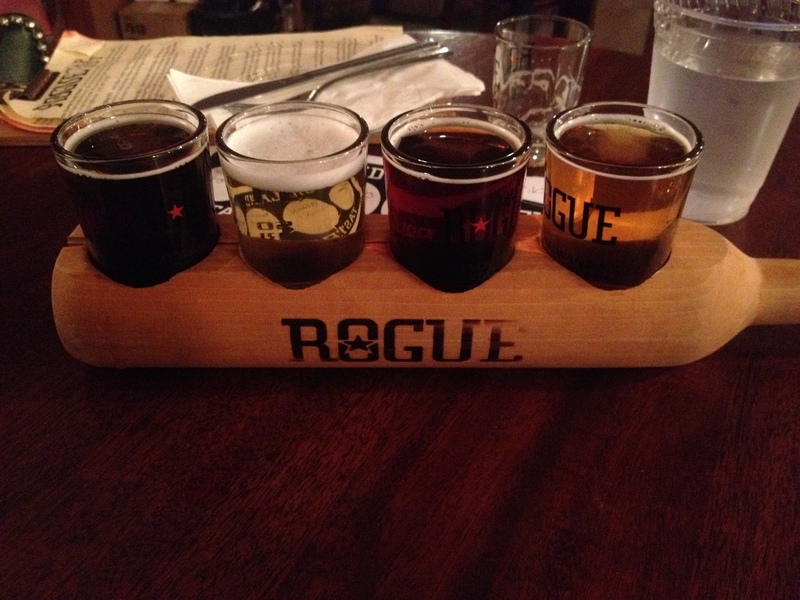 I’ve had Rogue beers out here in DC, but their brewhouse beer menu had three pages and I had two sampler trays there. They even had mead, which was good. So if you are in Portland – go there. Song of the week: Creep by Postmodern Jukebox. My best friend introduced me to Postmodern Jukebox, which reinterpret songs in old-school styles. This is a version of Radiohead’s Creep in a old-school blues style and I heard it at a blues club in Montreal before the band started to play. It gives me chills in the best possible way. I have multiple cookbooks that have recipes for cornmeal cookies. The concept seemed absurd to me, but over the last few weeks I’ve become intrigued by the concept. I don’t even like cornbread, but I love polenta and various things I’ve made with masa harina, so I thought I’d give it a shot. Some recipes suggest lemon, and others lime. I went with lime for this one, for the very logical reason that I don’t have any standard cornmeal in my apartment – I have masa harina. Since masa is treated with lime, going with lime for the citrus flavor seemed logical to me. The result: Easy and surprisingly good. 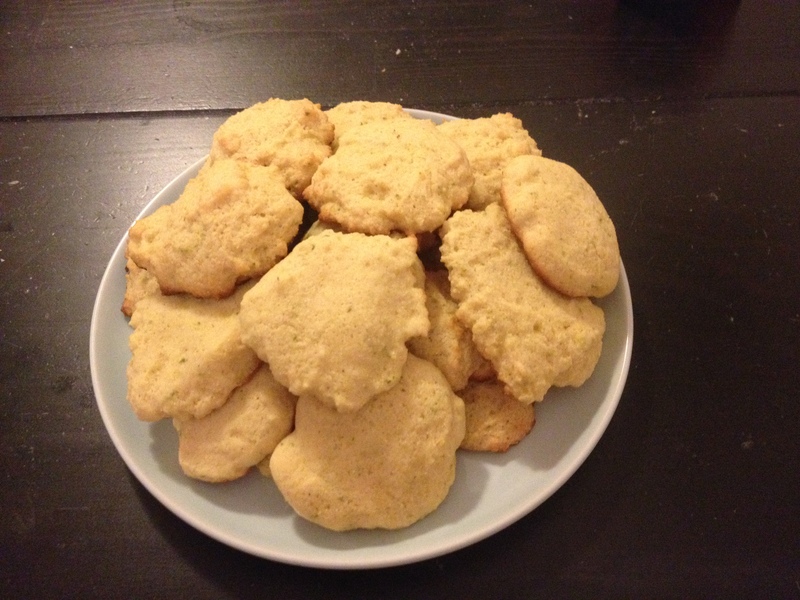 The cornmeal adds some texture without being distracting about it, and the overall cookies have just a hint of lime. Just enough you know it’s there, but not enough to be overpowered by it. They aren’t quite savory cookies, but they aren’t overly sweet either. If I had to make one modification, it would be adding the zest of a second lime to the dough – I only used one. I’ve asked a friend come over and test them for a second opinion later today – hopefully he will like them as much as I do (I’ll make sure he doesn’t eat any of the singed ones). Song of the Week: The Sleeping Beauty Waltz by Pyotr Tchaikovsky. I’ve been listening to a ton of Tchaikovsky the last few days, and while much of what I’m listened to has been much darker, I love this waltz. Partially because Sleeping Beauty was one of my favorite Disney movies when I was little and this waltz is in the movie.